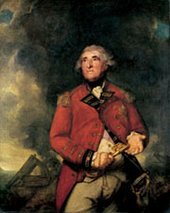 Britain was at war for much of Reynolds’s lifetime. Major conflicts in Europe and America shaped the society and culture in which he worked. The victors and victims of the battlefield were recorded in books and newspapers, broadsheets and ballads, paintings and prints. 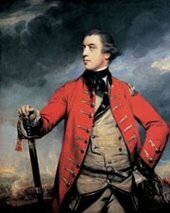 Reynolds’s portraits of commanders and officers contributed to the development of a powerful form of martial celebrity. But Reynolds wanted to do more than simply convey the appearance and character of these military heroes. His portraits also refer to some of the most important events in contemporary British history, engaging with the shifting ambitions and anxieties of the nation served by the men he painted. As well as this, Reynolds’s contemporaries acknowledged that he managed to develop the best aspects of the traditions of portraiture he had inherited, while at the same time taking British portraiture in striking new directions. His military portraits were ambitious works of modern art. Hamilton was celebrated for his bravery during the wreck of a ship carrying George II back from Hanover; he remained on board until everyone had been rescued. The stricken ship in the lower right corner reminds viewers of his heroism. Hamilton wears the uniform of the Hungarian Hussars, whose celebrated role in the War of the Austrian Succession made their uniform popular as a masquerade costume. The outfit, including the richly decorated dagger, gives Hamilton the exotic glamour of an adventurer. 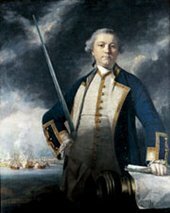 Augustus Keppel was a celebrated British naval commander, and a close friend of Reynolds. As the son of the second Earl of Albemarle, Keppel was also to prove one of Reynolds’s most influential patrons. 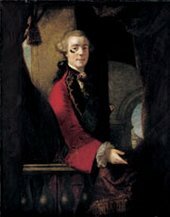 This portrait, painted immediately after Reynolds’s return from Italy in 1752, was one of his most important early works. The pose, based on a drawing Reynolds had made of a statue of Apollo, emphasises Keppel’s heroic qualities. 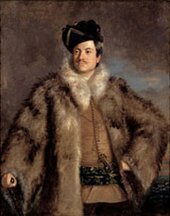 Lord Cathcart was an aristocrat and soldier who had been wounded three times during the previous decade in a succession of armed conflicts. 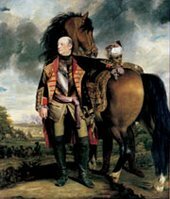 Most seriously, he had been shot in the face when acting as aide-de-camp to the Duke of Cumberland at the battle of Fontenoy in 1745. Reynolds’s portrait shows off the black silk patch he used to cover his scar. an Officer of the GUARDS with a Letter in his hand, ready to mount his horse with all that Fire mixed with RAGE that WAR and the LOVE of his Country can give. This portrait shows the thirty-year-old Captain Robert Orme in the uniform of the Coldstream Guards, standing in a corner of a North American forest. Significantly, the scene in the distance is not, as you might expect, a celebrated military victory. Instead it shows a catastrophic defeat by the French army near the Monongahela River in America, in the summer of 1755. Nearly nine hundred British and American soldiers were slaughtered; Orme, though shot in the leg, survived. to become his Rough PROFFESSION… but no man Manifested a more temperate and STEADY COURAGE in action. Lord Rodney, born into an aristocratic family, became one of the most distinguished British naval commanders of the eighteenth century. 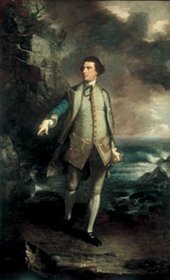 The delicate play of light on his Rear Admiral’s uniform suggests a refinement which counterbalances the authority of Rodney’s pose: he stands on a rocky outcrop overlooking the sea, his hand resting on an anchor. Reynolds was countering the widespread charge that Britain’s aristocratic elite was too enfeebled by luxurious living to provide heroic leaders. This portrait celebrates Hervey’s involvement in the recent attack on Moro Castle in Havana, shown in the background. His sword is silhouetted dramatically against the smoke-filled sky, while his left hand rests on a plan of the distant castle. His face and chest are strikingly spotlit, as if illuminated by a flash of gunpowder. The patriotism expressed by the portrait also suggests a ruthless form of colonial dominance, in which the Cuban landscape is pictorially buried. 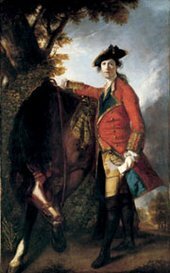 Reynolds painted this portrait of Lord Granby shortly after the successful conclusion of the Seven Years War against France in 1763. The Commander-in-Chief of British forces is standing on the battlefield at Vellinghausen, the scene of a major victory against the French in July 1761. Granby is shown as a man of Herculean strength with something of the physical authority found in classical statues of martial gods. This portrait was commissioned by Burgoyne’s friend, Frederick Count Schaumburg-Lippe, to celebrate their friendship and success during a recent military campaign in Portugal. Burgoyne towers above a battlefield filled with massed ranks of cavalry and infantrymen. In the distance is the skyline of a town, presumably Valencia d’Alcantara which his troops had dramatically captured in 1762. Burgoyne was known as ‘Gentleman Johnny’ for his good manners and affability. Appropriately, Reynolds has fused the pictorial languages of aristocratic poise and military command. O ye! Our ISLAND’S PRIDE! And Nature’s boast! Whose peerless VALOUR guards and Gilds our coast. 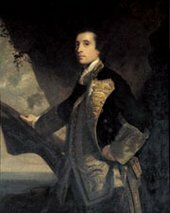 Reynolds painted this portrait to celebrate Admiral Keppel’s victory, not at sea but in a celebrated court case which had cleared him of misconduct in a recent naval engagement. Keppel’s stance and his expression exude defiance, his left arm propped on his hip, his right hand firmly grasping the hilt of his sword. To his allies Keppel personified the Whig aristocracy; a man ‘decorated with honour, and fortified by privilege’. Just weeks before he sat for this portrait, General Eliott had been made Lord Heathfield, a reward for his remarkable achievements as governor of Gibraltar. Eliott became a national hero after successfully defending the peninsula against a three-year siege by the Spanish and French. The key signifies both his and his nation’s loyalty to its colony. Significantly, the portrait was commissioned by a print publisher who wanted to exploit Lord Heathfield’s celebrity through the sale of prints after this painting.